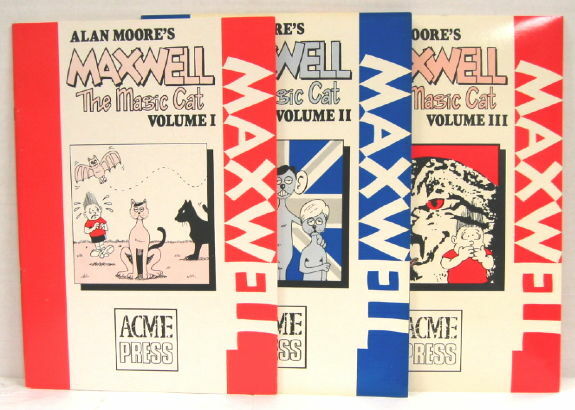 Maxwell the Magic Cat Volumes I-IV (Acme Press, 1986-7). I’m pretty sure I’ve talked about my Maxwell the Magic Cat books before on the site, but it’s been a while, and they seem to fit into my little tour of oddball books from my collection. This was a series of four black and white staplebound books, measuring 8 1/4 by 11 inches, reprinting Alan Moore’s comic strip from The Northant Post . 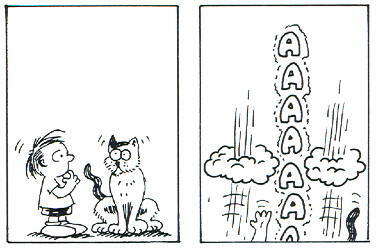 The strip ran about seven years, written and drawn by Moore under the homophonic pseudonym “Jill de Ray” (after a particularly nasty serial killer). A lot of the strips were like this, metatextual examinations of the very idea of a comic strip and its format, but the strip ran the gamut from simple sight gags, to real groaners of puns, to political humor, to outright absurdity (such a favorite sequence of mine, where a snake carries on a torrid affair with Maxwell’s tail). 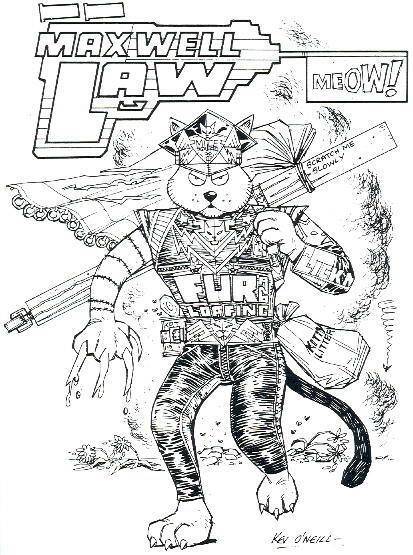 Occasionally…well, mostly…Moore’s artistic reach exceeded his grasp, but his gag-writing is solid and usually clever, and the general roughness of the art is just part of the charm. If the drawing were more polished, it just wouldn’t be Maxwell the Magic Cat . Now, I’d originally bought volumes 1 through 3 (pictured above) as they were released, in the mid ’80s. I never saw volume 4 on the shelf, and at the time I just assumed it never came out. Eventually, I discovered that volume 4 had been released, but for some reason it appeared to have limited distribution. I don’t know if it actually did, or if it was just hard to find in my neck of the woods, or what the deal was, but several years of casual eBay and Amazon investigations seems to bear out my belief that the fourth book is the rarest of the volumes. 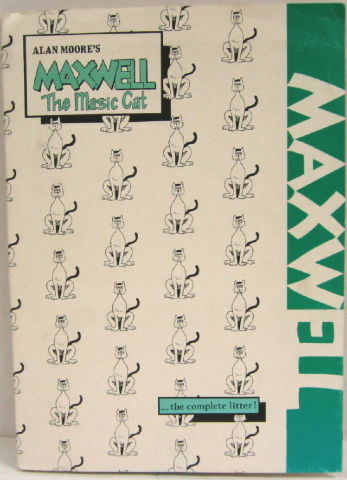 That would be the folder which accompanied the Complete Maxwell the Magic Cat Set of Volumes One Through Four, and indeed, volumes one through four were to be found within. Look, it’s number four, and it’s real! It exists! And it’s totally mine now! 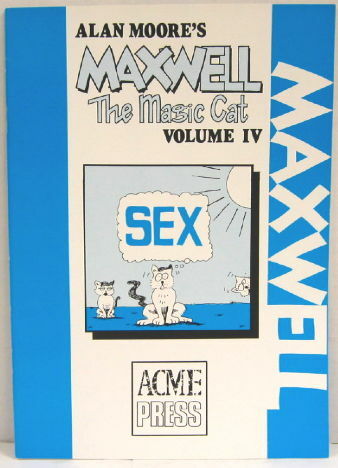 When the Maxwell the Magic Cat revival comes, that’s what I want to see. The first book’s pricing starts at about twelve bucks, the second ranges around $30, the third only has one for sale at $65, and good gravy, some hopeful seller has the fourth at $249.99. Plus, a quick eBay search reveals plenty of the first volume, one copy of the second, and none of 3 and 4. I suspect a reprint of these, perhaps collecting all the strips into one book, would be in order…but I wouldn’t hold my breath. I would like to ask your permission for using The Marxwell Law picture on my own french/english Marshal Law’s site. I’ve already another version of it in the 1990 Graphitti Designs paperback of Fear and Loathing, but it is too small to obtain a good scan. Avatar wanted to do a collection, and Moore asked them not to. He doesn’t want the people who own the rights to make money off of his name, partially because the reason he originally stopped down the strip was that the rights owners were pursuing homophobic laws. (This led to the AARGH project).